Carlson Capital Management is pleased to announce the firm has been named to the U.S. Chamber of Commerce top 100 small businesses in the country for its annual Dream Big Blue Ribbon Small Business Award. The award is one of the highest honors given annually by the U.S. Chamber of Commerce and recognizes businesses for exceptional, innovative business practices. Winners were selected from a record number of applicants from communities across the nation. They were judged in four key categories: strategic planning, employee development, customer service, and community involvement. An important milestone on January 1, 2016 turned CCM from family-owned to an employee-owned firm, moving from three shareholders to 40. While not the first Registered Investment Advisor firm to extend ownership to employees, it is believed that CCM is one of a handful of independent wealth management firms in the country to take this step. On March 9, the Chamber will announce seven regional finalists from among this year’s Blue Ribbon Small Business Award winners. All of this year’s winners will be honored at the 12th annual America’s Small Business Summit, which takes place June 13-15 in Washington, D.C. During the summit, one regional finalist will receive the DREAM BIG Small Business of the Year Award, sponsored by Sam’s Club, and a $10,000 cash prize courtesy of the U.S. Chamber. 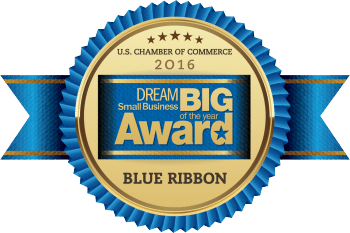 Each year, the U.S. Chamber of Commerce seeks nominees to be recognized as top 100 small businesses as part of its Dream Big Blue Ribbon Small Business Award program. According to the organization’s website, the 2016 Dream Big Award Winners were selected from a record number of applicants from across the country and were judged in four key categories: strategic planning, employee development, customer service, and community involvement. CCM did not pay a fee to receive this award. CCM has paid no fees to the U.S. Chamber of Commerce to promote this award. CCM was nominated for this award then completed an application for this award. CCM is a member of the U.S. Chamber of Commerce, which was not required for this award.